I was very pleased to meet Steve NY3A over 3800 miles from PA. His signal was strong. I answered his CQ with just 80 mW. I was surprised that he could hear me, but no doubt, because the response was immediately correct. WOW. But also QSO's with 2.7 Watts can be remarkable. I was thrilled by the Excellent Ears of KI1G, UA9FGJ and EA8OM. I answered their weak signal and they came back immediately with a correct response. WOW again. In my log, I use EE to designate a station with Excellent Ears and IC in case of an unexpected Immediately Correct response. The most difficult part of using the lowest possible power, is to choose the power. If I choose a power that is too low, I loose much time. When a station is time and again calling CQ, that is no problem. Then I use low power and increase the power every time I notice, that my signal is not heard. 1000 Miles per Watt. All QSO's with 1.8 W or less are 1000 MPW QSO's. And also all 23 QSO's with 2.7 W to the USA. 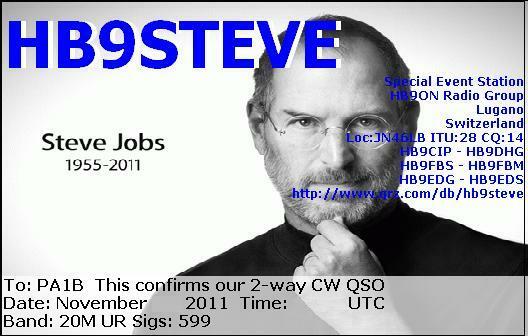 HB9STEVE is a special event station to commemorate the life of Steve Jobs. The station was active during November 2011. I received the special QSL via eQSL. To check the locator, I have sent a e-mail to Fulvio HB9DHG, who quickly responded. especially the 3600 QSO's in just one weekend (the CQ WW CW). I'm happy you're in the log. When I heard HB9STEVE in the CQ WW DX CW contest on 14 MHz, it I took my a while to figure out the "long" Call. Since I try to use the lowest possible power in any QSO, I reduced to 360 mW, before answering. The border of Switzerland is only 330 miles away, but luckely Fulvio (HB9DHG) and his team were located in the southern part of Switzerland, so we breached the 1000 Miles per Watt boundary. With a distance of 446 miles and a power of 360 milliwatts, this QSO is good for 1240 MPW. Thank you, dear Fulvio and team. I started Saturday morning at 0015 UTC and stayed on until 0140 UTC, to make 18 QSO's on 80 meters. It was terrible. I felt it for a few days and the next day I could not wake up. I should have gone to sleep before midnight, to start early Saturday morning. On Saturday the 26th, I went back on the air, as late as 1100 UTC, to find good propagation on 21 MHz. I used the Lowest Possible Power in each QSO, with a power of 18 mW to 800 mW, with stations in Europe and later in North America. (See table 21MHZ 26th). At first I used 360 mW, but later the S-meter went up and I was very pleased to work N2NT and VO1TA, with a QRPpp power of 80 mW. I also made a few QSO's on 28 MHz. When 21 MHz and 28 MHz closed, I went to 14 MHz, to make a few QSO's with 80 mW to 800 mW and then continued on 3.5 MHz. Most of the time, I use the maximum power of 2.7 watts on this band. On Sunday morning I continued on this band and even made a QSO with KC1XX. The propagation on 7 MHz was bad, so all QSO's with Europe were made with full power. A few years ago it was possible to make QSO's with 100 mW or even less, on this band. After half an hour, I switch to 14 MHz, to work stations from Europe and a few stations from north America. Over time the propagation got better, so I could reduce the power gradually. Later in the afternoon I shifted the emphasis from the Lowest Possible Power to the highest QSO rate. On Saturday I had to glue myself to my chair. Many times I walked out of the the shack to go down stairs after a few QSO's. On Sunday I could stay on the air for long periods of time. After making this analysis per continent, I realized that all QSO's to North America, South America and Asia are more then 1000 Miles per Watt QSO's. A quick count revealled another 70 "1000 MPW"
QSO's in Europe, so I estimate that the total of 1000 MPW QSO's will be around 170. It is great to see, that other Bloggers also have used QRPp in the CQ WW DX CW contest. More FUN with lower power. Mike VE3WDM also used 500 mW with an indoor attic fan dipole. Click here to check out the list of 1000 MPW QSO's, made with 500 mW.